SpaceX's Falcon 9 rocket and Dragon space capsule sit on the launch pad at the Cape Canaveral Air Force Station's Launch Complex 40. SpaceX's unmanned Dragonspacecraft has officially completed its inaugural test flight, after splashingdown in the Pacific Ocean. The spacecraft's targetedsplashdown location is 500 miles (nearly 805 kilometers) west of the coast ofMexico. The capsule's drogue chutes were successfully deployed, followed by thevehicle's three main parachutes to slow the Dragon on descent. The unmanned commercial Dragon capsulehas completed a de-orbit burn as it prepares to return to Earth from its firsttest flight. The burn lasted about six minutes, SpaceX officials toldSPACE.com. In a Twitter update during theburn, SpaceX officials reported that the capsule was, "looking good." The spacecraft is expected tosplash down in the Pacific Ocean about 500 miles (nearly 805 kilometers) westof the coast of Mexico at a little after 2:00 p.m. EST (1900 GMT). SpaceX's Dragon capsule is makingtwo orbits of the Earth as part of its first test flight under NASA'sCommercial Orbital Transportation Services (COTS) program. SpaceX has reported that theDragon is performing as expected so far. In a recent Twitter update, SpaceXofficials said that the Dragon is in orbit and is performing maneuvers. The company has pinpointed thelocation of the first stage of the Falcon 9 rocket in the Atlantic Ocean.Recovery boats are currently on their way to the location. After successfully reaching orbit,SpaceX is reporting that the Dragon capsule is "performingnominally." In a recent Twitter update, SpaceXofficials said, "A big thank you to NASAfor their continued support! What an awesome partnership!" The commercial Dragon spacecapsule has reached orbit for the first time. The first and second stages ofSpaceX's Falcon 9 rocket have separated, with the first falling back to Earth.The second stage is now firing to carry the Dragon capsule to orbit. SpaceX has launched the Falcon 9rocket, carrying the first ever operational Dragon spacecraft to orbit. SpaceX launch control teams havereportedly fixed the issue that caused the abort during the first launchattempt this morning. According to SpaceX officials, the problem was a falseabort on the Ordinance Interruptor (OI) ground feedback. The company will nowtarget a launch time of 10:43 a.m. EST (1503 GMT). In a Twitter update from NASA'sKennedy Space Center, officials said, "This morning's abort resulted froma false indicator for the Falcon 9's ordnance interrupter, part of the rocket'sflight termination system." SpaceX launch control teams havereportedly fixed the issue that caused the abort during the first launchattempt this morning. According to SpaceX officials, the problem was a falseabort on the Ordinance Interruptor (OI) ground feedback. The company will nowtarget a launch time of 10:43 a.m. EST (1543 GMT). SpaceX has aborted its firstattempt to launch the Falcon 9 rocket and Dragon capsule this morning. Thecompany still has two launch windows to try again. "Wehave an abort on terminal count," a SpaceX launch commentator said. Theabort took place just under three minutes before launch. The countdown clock isbeing reset to the T-13 mark, and the next scheduled attempt will take place at10:42 a.m. EST (1542 GMT). Everything remains on track for a 9:06 a.m. EST (1406 GMT)launch. In an update posted to NASA's Twitter account, officials said, "Bothstages of the Falcon 9 launch vehicle are loaded with fuel and are being toppedoff. Weather looks good for 9:06 a.m. EST liftoff." "The SpaceX Launch director has asked the Range SafetyOfficer to check the range. All systems are go," they added soon after. A new launch time has been set for the liftoff of SpaceX'sFalcon 9 rocket and Dragon capsule this morning. The company is aiming for 9:06a.m. EST (1406 GMT). Current weather conditions here at Cape Canaveral are coldbut clear. The countdown clocks are now ticking down the hours andminutes to the launch of SpaceX's Falcon 9 rocket and Dragon space capsule.SpaceX is aiming to launch at 9:03 a.m. EST (1403 GMT). The company has between9:00 a.m. EST (1400 GMT) and 12:22 p.m. EST (1722 GMT) to launch within thecurrent window. Commercial spaceflight company SpaceX is set to launch itsFalcon 9 rocket and Dragon space capsule on its inaugural test flight thismorning. The company has between 9:00 a.m. EST (1400 GMT) and 12:22 p.m. EST(1722 GMT) to launch within this window. NASA TV will air live coverage of the launch beginning at8:55 a.m. EST (1355 GMT). Watch the live webcast here. After a 24 hour delay to repair a cracked engine nozzle,SpaceX has cleared its Falcon 9 rocket and Dragon space capsule for launchtomorrow (Dec. 8). 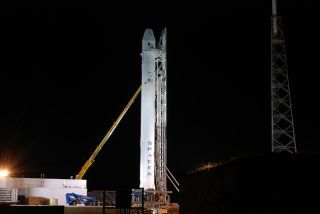 The private spaceflight company is making final preparationsto launch the Falcon 9 rocket and Dragon spacecraft on its maiden test flighttomorrow morning from Launch Complex 40 here in Cape Canaveral, Fla. The launchwindow opens at 9:00 a.m. EST (1400 GMT) and closes at 12:22 p.m. EST (1722GMT). In an update posted to SpaceX's official Twitter accountlate tonight (Dec. 7), company officials wrote: "Still looks good fortomorrow. Get some rest, it?s going to be an early morning!"